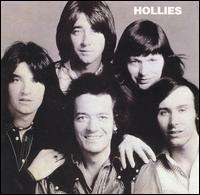 Hollies is a 1974 album by the English pop-rock band The Hollies, marking the return of Allan Clarke after he had left for a solo career. The centerpiece is the band's classic cover of Albert Hammond's ballad "The Air That I Breathe," a major worldwide hit that year. It also contains yet another "Long Cool Woman in a Black Dress" soundalike in "The Day That Curly Billy Shot Down Crazy Sam McGee". "The Air That I Breathe" was a worldwide hit which was received very well. Another single from the album, The Day That Curly Billy Shot Down Crazy Sam McGee, was a top 30 British hit that revived the guitar driven rock of "Long Cool Woman in a Black Dress". In the Netherlands it did even better, topping the singles charts for two weeks in November 1973. "I'm down" was another successful 1974 single that could have been on the album, but wasn't. Strange that this song is not at least among the CD re-issues' bonus tracks.